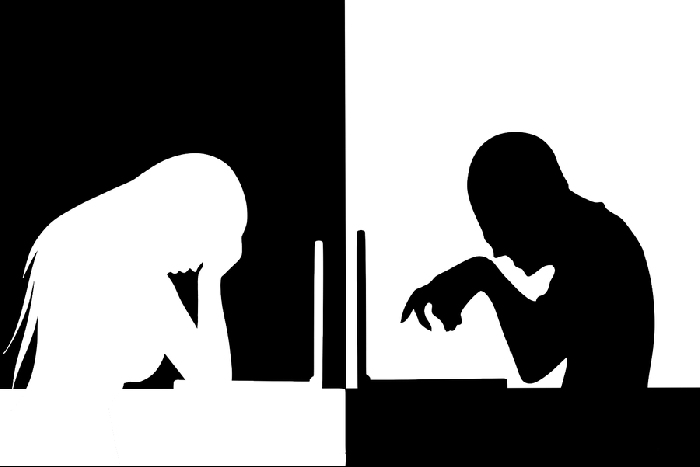 It is a very sad fact that in todays modern age where most people have almost instant access to online technology, around 75% of people, children and adults alike, have fallen victim to the new surge of online cyber bullying. Hidden behind a keyboard, these computer warriors can write whatever they like about a person and with the click of a button, the slander, lies and defamatory comments become visible online for the whole world to see and read. Most people see through the smoke screen of untruths and simply have enough going on in their own lives to keep them occupied, so the poisonous words fall short, instantly being seen for what they are and ignored. Unfortunately, there are those who, like spoilt children in a playground, almost gather round and start to gang together, spreading the malicious gossip, it is from this point that those who are being attacked and bullied can start to feel as if the whole world is against them and it can appear as if everybody knows and has something to say, almost twisting the knife that bit more. Having been a victim of this cowardly act of cyber, or online bullying myself, I can truly empathise with those who are having to endure this relatively new concept which stems from the keyboards of very unhappy, insecure and jealous individuals. To be honest, I feel pity for them, how must it feel to be so bored and unsettled with your own life and who you are as a person, that you feel the need to inflict your own hatred upon others? Faceless keyboard warriors are there across the spectrum and come in many guises, mostly made up profiles on the various social media sites, along with those who seek to feel superior in attempting to put others down, as a way of feeling self-important I suppose, which again points to their own insecurities, jealousies and frailties, I really pity them. The attack upon myself was instigated way back in 2014. I had left a group that I had previously joined and after realising I did not want to be a part of it, I walked away and started doing my own thing and living my own life, in a nutshell, I wouldn’t be controlled, so I removed myself, therefore I removed any power those individuals thought they had over me and as we all know, having power over others is important to so many people. I started writing magazine articles and having my first books published, this was obviously seen as a threat, so it is from this moment that the online attacks and slander started. An online blog from a made-up person stated that I had viciously attacked my ex Wife, had been imprisoned for eight months and that I was a Heroin addict. There were even images of my ex Wife with bruises, so this quickly became shared over social media sites and my popularity soon faded. The images were of my Wife, obviously I was not responsible for them and seeing as she is not here now I will not explain how she got them as that would not be fair. What I will say is that these images didn’t appear until two years after I walked out on her and she had her own fair share of inner problems and issues anyway, so I will leave that there, apart from pointing out I was a Heroin addict. I share that on my other pages here and yes, I have been to prison, for shoplifting and driving offences, nothing else. Seeing these images and having people judge me on these slanderous untruths was a difficult period and at the onset of them, my Mum was dying, this did not matter to those involved, still the onslaught continued. From members of supposed alternative beliefs and spiritual people that profess to not judge others, followers of various Christianised belief systems, people who claimed to be friends, had stayed at mine and ate my food, along with others who were probably once again just feeling insecure and lonely in their own lives, believe me I have been judged by them all. The most important thing with any form of bullying, whether it is physical, or online, is to not feed it, do not retaliate and do not start to justify what is an untruth anyway, this only serves to feed their own inner hatred and can make matters worse. I ignored them totally and knew that the truth would come out in the end, as there was no evidence at all, no criminal record for the supposed incident and if people had looked, they would have seen that, but bullies don’t care, all they seek is glory and self-importance at the cost of others, how very sad indeed. I complained countless times to Google to get the various blogs removed, yet it seemed an impossible task, you cannot e-mail them direct, nor call a complaints department, it is farcical really and for those having to endure this type of harassment, it is heart-breaking. When these cowardly acts started on myself, online bullying was not really recognised, so it was a lot harder to have items removed. In early 2017 I contacted a company who specialise in online reputations and the removal of derogatory and untrue comments and by the middle of 2017 the first ones were successfully removed, there have been others since, all from the same source, which have been removed also. To have anything removed from Google and other search engines, you must prove 100% that you are innocent of what is being said about you, if there is any truth in it, the item will remain in place for all to see. All these modern gadgets we have now are great, and we can instantly contact people around the world, that is the plus side of it, on the other side, there will always be those who have nothing better to do than project their own self loathing onto others, we just have to ignore them and hope they find some peace within themselves, until then, just don’t retaliate or give them any power at all. Feel free to contact me about this, maybe you are going through bullying yourself, if you are, maybe I can help? Contact me about this, or any other subject which I openly share on my website, or you can contact the online reputation company which I used, their details are below. Don’t let the bullies win and speak up against online and cyber bullying.